What if you could have a piece of your favorite artist in your hand? From custom, hand-crafted designs to production runs in the tens of thousands, Vinyl Toys are the sculpted creations of graphic designers, graffiti artists, painters, illustrators, and creatives of all kinds. So how did everyday plastic move from shelves to gallery pedestals? Join us this October as we explore the Urban Vinyl and Art Toy movement and the creative forces behind it with D. Ross “Scribe”, Jeremy “MAD” Madl, and Carson Catlin. Learn about their perspectives on the industry, their process, and check out some really amazing work. Donald Ross also known as “scribe” is 40 years old and currently lives in Kansas City, Missouri of the United States. The animated, public murals by Scribe are readily recognizable in Midtown Kansas City and throughout different part of the United States, Canada and down into Mexico where he has both painted murals and had gallery shows. Scribe incorporates a menagerie of animal characters developed over many years representing a particular, self-referential trait that he inserts in various scenarios. He is currently the Art Director at Children’s Mercy Hospital in Kansas City where he does everything from graphic design, painting murals throughout four locations around the metro and managing large scale design and installation of a Terrazzo Flooring project. Scribe’s latest focus has been on what is called the Urban Toys where he has had several figures released and sold out in 2009 based on his signature character “Rumpus” the rhino and “Sumego” an egotistical beaver. In 2010 the Resound Fields mini figure series was released and was made up of seven of his characters and several larger characters with Cardboard Spaceship out of Santa Cruz and Bic Plastics out of China. I’ve been professionally illustrating and designing toys for over 13 years. Over my career I’ve worked with clients such as Kidrobot, YUM Brands, Pepsi, Scion, NFL, Upper Deck, Mattel, Spin Master Toys, and Cartoon Network on a variety of todays hottest and largest brands. Collaborating on projects ranging from promotions to packaging, character design to retail and premium toys. I’ve worked non-stop on my own licensed artwork and toy brands under the “MAD Toy Design” label for the past 9 years. My first production figure line called the MADL™ has been one of the hottest brands on the collector market since it first released in 2004 and continues to fly off the shelves globally with each new release. By day I work as a motion designer. By night I make customs. I got into doing customs toys in 2010, and what started as a hobby has turned into a lot more. I strive to do things I haven’t seen before. Custom toys are the only medium I’ve been able to look at, see exactly what I want in my head and then create it. My work technique ranges from the extraction of shapes, to threading, to the insertion of toothpicks or blocks. Regardless of the method, I always want my work to stand out. 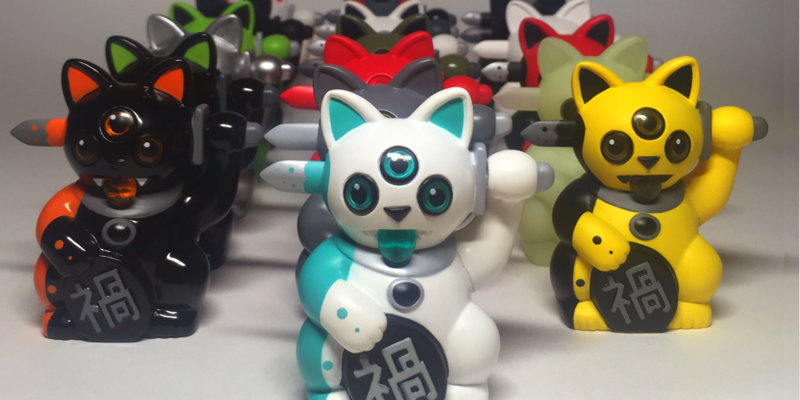 My customs have been shown at NYCC, SDCC, DCON, and many other vinyl toy stores. In 2013 I was nominated for Break through artist at the Designer toy awards.